A pair of Victorian style door knobs with natural rosewood "beehive" design, brass collars and brass rose plates. High quality, hand turned, solid rosewood door knobs/handles made to an original Victorian beehive design. Hand turned natural solid rosewood handles with rich colouring. We're pleased you would like to review Victorian Door Knobs - Rosewood Beehive - Brass (pair). I ordered 11 sets of these and all were of good quality rosewood and brass finish - very pleased. These are superb value for money! Fabulous quality and very authentic. We are going to replace all of our handles to these as we are delighted with them. Very pleased with these well-made doorknobs. Nice to the feel and good to look at the only slight criticism was the rather long black screws. The length of the screws meant that they fouled on the mortice lock inside the door. Replaced with short brass screws which both look and work better. Prompt delivery. Very pleased with door knobs which look great on our old kitchen door. It was a bonus to receive with the product clear fitting instructions. thank you. the item is lovely. I had chosen the incorrect doorknobs initially but the company exchanged them straight away with no quibbles good customer service. Bought these for our Victorian house. they are excellent quality and look fantastic. We have decided that when we decorate our hall and landing later this year we will change all the handles to match these. The service was first rate too. Very good quality and service. I am restoring a grade 2 listed property and these go very well. Will be ordering more through my builder and will also be having cupboard nobs to match. Thank you. I am really pleased with my purchase, good quality, fast delivery and excellent customer care. I would definitely recommend. The door knobs themselves are beautiful and they arrived within 24 hours of ordering which was brilliant. I also needed to call for advice and the person at the other end was very nice and helpful. Thank you, would definitely recommend. 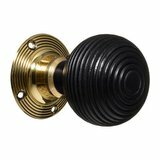 High Quality product ( beehive antique door knobs) both the rosewood handle, the brass base and the spindle are manufactured to a high standard. Look the part on internal panelled Victorian doors. I bought a pair of these a month ago to gauge their quality which turned out to br superb. I have since bought and fitted another five pairs. All look perfect in a small Victorian house. Substantial, beautiful colour and wonderfully tactile. A joy to look at and use! Excellent service and superb value for money, stunning handles which we have out throughout and really suits our Victorian house. Would highly recommend. Superb service and product. Would highly recommend both. Excellent service and product is stunning, extremely good value for money. Would highly recommend the company and the product. Very good quality for the price, will buy more for the house. Rosewood Beehive - Brass (pair). after being told i could get similar to these beauties elsewhere for a lot more, i stumbled onto this site - low and behold, better quality and better priced!! Being fitted as we type! These are quality knobs a and very well finished.but I would have been happier with brass screws to compliment rose colour.i.e brass or chrome to suit and not the black supplied! It cost me extra to purchase from diy store. Beautiful handles, first class service and delivery . I would recommend this site and product without hesitation! The handles look beautiful in my 1923 property and like they have always been there so obviously look authentic!! Quality is first class and price makes them very good value. Excellent product, excellent price and excellent delivery. No need to look anywhere else!!!! Very pleased with these victorian door knobs . Look great on our 1930 doors and really look the part. Was not sure if they would work with the rim locks that were on the doors but on telephoning up was informed they would be fine which they were. 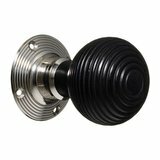 These door knobs are also great value for money and the quality is good. Great quality. And superb finish. Look great in my house, would highly recommend. Excellent service., the product is exactly what we required for our restoration project and we will would recommend Vintage Door Knob centre to clients for future works. Excellent well finished product, delivered promptly. Thank you. We spent ages looking on the internet and these were exactly what we wanted at an excellent price. We got one first to check the quality and were delighted. The postage was also very fair as posted to us in Ireland and they were great deal with. Very happy! These door knobs were just what I'd been looking for, the rosewood was the colour I needed for the cottage I am renovating to keep its original character. Awesome quality, value, attention to detail. I am delighted with my purchase. The product is beautiful and manufactured with excellent attention to detail. The brass fittings are heavy and substantial and the colour and reeding on the knob are perfect. I was also really impressed that each pair is not only accompanied by a little bag for the screws and an allen key for the grub screw, they were really well packaged too, wrapped and boxed. My doors have been transformed by these door knobs, I can't recommend them highly enough. These are really lovely. I couldn't believe they'd be good quality at such a low price so I ordered one as a test. They are perfect, great ŵeight, quality materials. We are waiting for them to come back in stock, planning to order another 13 sets. Excellent service, arrived promtly and look good. 2nd order of handles and nice size to use. Will be ordering more. Just purchased 10 more sets of door knobs. Super impressed and have fitted three sets already. Excellent quality and look amazing now we are decorating the rooms. Would strongly recommend. Good size and comfortabel to use. Good size when hands very cold /wet. Am buying more to complete all house doors. Only problem was the metal shim wasn't tight on the handle spindle and required to be pressed tight to handle before fitting to,original locks. These handles are excellent value - well made and beautifully finished. As good as others twice the price, prompt delivery, would have no hesitation in using the company again. I feel fairly neutral with regards to this product. The product itself is good but for some reason the screws supplied with it seem to have little to no relevance to the material used. Basically, the screws are a rusty dark coloru and not brass like the handle. It could be that the brass will weather with time to a horrible dark and worn finish as opposed to mellow. I certainly hope not and in the mean time will go and source some brass screws from a local diy shop. In summary, product is nice but don't feel the screws that come with them some be of identical material to the handles. Excellent quality product at a fantastic price. I wish I had more doors! Excellent product at very competitive prices. Quick and efficient service. Such beautiful rosewood door handles at a really affordable price, will definitely be ordering these again to put throughout our new build when complete. Excellent quality product at the price. Very good experience overall. Ordered Victorian (Beehive style) door handles after doing a lot of research online. Really competitive pricing from Coventry, excellent service and the product is of a very high quality. Would definitely recommend and will be shopping here again. Great quality handles- better than any I have seen - lovely richness to the wood- look fab with my Georgian doors and art deco finger plates! We are renovating a Victorian house & had been pretty lucky sourcing original handles but then they became almost impossible to get so we turned to reproductions. These handles are very nicely made. Really sturdy & very reasonably priced. I bought 3 pairs so that 3 doors on to the hall now all match!! Service was very quick too. Bought 4 of these knobs.Very very good value for money and very genuine looking and feeling product.Lovely finish on wood and brass and love the heavy feeling of them.Very happy customer.Much better than knobs three times the price. Very nice handles, excellent quality and fast delivery. Very pleased overall. I am delighted with these which complement our 6 panelled Edwardian doors well.The Pitts mortise system is ideal for adjustment.The price offers excellent value allowing me to unreservedly recommend this company and their product. These door knobs are a fantastic weight & the brass looks a warm, old fashioned colour (not like modern, nasty, shiny brass). We haven't fitted them yet, but they look perfect for our Victorian renovation project. The delivery was swift too. Great service, goods promptly delivered and as described - Would certainly use again! Handles pretty good quality, some black paint was missing in one or two of the grooves, but this wasn't a problem as I was fitting to rim locks and only needed 4 roses. The supplier of my reclaimed doors couldn't believe the price, he sells similar for about twice the price or more. Really pleased with these. I bought four sets and they look the part in my georgian house. Good quality and fit really well - look as if they've been there years! The door knobs arrived very quickly - within 48 hours of ordering. The quality is excellent - they are very well made and easy to fit. Remarkable value for money - I have no hesitation in recommending this product and company. Excellent service all round. Tracking for shipping details and very speedy dispatch. Quality superb for the price. Good product, good service what more could you want. Can highly recommend this company. Super quick delivery and very happy with product. Handles look great! Excellent product. Quality item. Fast efficient delivery. Excellent quality,the brass is of good quality and casting, and the turned knobs are crisp and have a reassuring weight. I have been in the antiques trade for 15 years and have seen many inferior quality copies of this style of knob over the years,but these are the best I have seen. Not to mention the very reasonable price. Minor thing, don't forget to add the VAT when comparing other sites. This was our second order. Using them on white-pained doors the idea was to tie into the sanded and stained flooring in the hall. They worked a treat, adding a special finishing touch. Upstairs we switched to the Georgian brass alternative as my wife preferred this feel for the carpeted landing/bedrooms. Now all we need is more doors! I bought these for a victorian house we are renovating. I thought the builders would not think much of them, but they think they are great and were really impressed with the price. I am really pleased with the price and they look fabulous now they are on the doors. I would highly recommend these door knobs. Terrific service. Terrific product. Am about to order some more! Arrived really quickly. Fitted easily. Looks great on my Victorian door. Very impressed with quality of these door knobs. Pleased with prompt service, may be ordering some more soon. Well done. These door knobs are lovely. They're good looking, solid wood and look easy to fix and adjust. I'm sure they'll look great when we fit them in our Victorian house. Really pleased with door handles, excellent service and delivery, would highly recommend. Great product, great price, great company to deal with. Great item at a sensible price. Ordering many more now !! Having seen these online and read the reviews, I ordered some samples. They arrived promptly. Very high quality reproductions at a sensible price. I promptly ordered a large number for the house and a number of other items as well. Highly recommended. Excellent quality at an amazing price. Would certainly recommend. Plus delivery was prompt. Speedy delivery, good value, fantastic quality. They look superb! Thank you so much. Excellent quality at an excellent price. I will certainly be buying these again. Delivery was very quick too. just what we wanted good quality, good price and good delivery. Ordered three pairs of the beehive door knobs. Absolutely lovely and the price and delivery was excellent. Everyone is really impressed. Even with the delivery charge it would impossible to find anything cheaper. Astonishing quality for the price. I'd read all the reviews before ordering so was confident they would be exactly what I was after. Well, they are and more. So good in fact, I'm about to order another six. Service was first class as well. Can't be faulted on all counts. Very quick delivery and the knobs are much higher quality than I was expecting for such a great price. They are lovely. After searching for quality handles that did not require a second mortgage to purchase I came across these and bought one to assess the quality. They are wonderful, very well made with ALL the bits including an allen key each for fitting and inexpensive (I did not use the word cheap deliberately). Great product at an unbelievably good price, ordered one as a sample first just in case and then promptly ordered enough to do the whole house. Beautiful wood and very nice authentic brass. Used with tubular latches for very easy installation. First class service and super quick delivery too! We had been looking for reasonably-priced victorian doorknobs for some time, but the problem was that the locks would only accept a fairly thin spindle, which ruled out many other knobs. These knobs are just right with their removable collar, and the price is quite frankly a giveaway being considerably less than just about all of their competition. I bought one set to see whether they would work and then quickly followed up with another four. And after all that, they look and feel just right too. I had to wait for these to come back into stock and it was worth the wait. The door knobs look very nice on and feel good to handle. Easy to fit by a basic diyer. Would definately recommend. These knobs have a good solid quality feel in the hand. They look beautiful on the 4 reclaimed Victorian doors we are just fitting in our Victorian terrace house. They have really changed the feel of the house - subtle quality! Excellent value for money too. These really are as good as the reviews suggest. So much cheaper than their competitors and yet the wood and brass is top class and perfectly enhance original victorian panel doors. Ordered saturday midday and delivered tuesday am - brilliant!